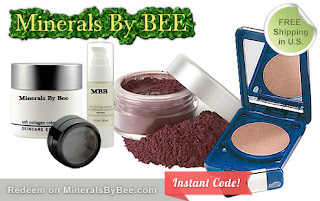 $15 for $30 to Spend on Minerals by Bee Makeup + FREE Shipping! Right now at DealPulp, you can get $30 worth of Minerals by Bee credit for just $15! This deal also includes free shipping. I visited the site and prices are very reasonable. I didn't do a thorough search, but I found lip gloss for only $0.99, mascara for $5, and eyeshadows for $6. There's also lots of skincare products such as masques, peels, firming gel, etc. Once you purchase the deal, you'll get a voucher code that can be used instantly on the cosmetics site!